Class I. Caves with delicate and fragile geological formations, threatened species, archeological and paleontological values, and extremely hazardous conditions. Allowable use may include mapping, photography, educational and scientific purposes. Class II. Caves with areas or portions which have sections that have hazardous conditions and contain sensitive geological, biological, archeological, cultural, historical, and biological values or high quality ecosystem. It may be necessary to close sections of these caves seasonally or permanently. It is open to experienced cavers or guided educational tours/ visits. Class III. Caves generally safe to inexperienced visitor with no known threatened species, archeological, geological, natural history, cultural and historical values. 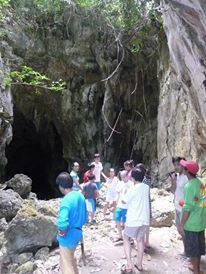 These caves may also be utilized for economic purposes such as guano extraction and edible birds nest collection. For example, the underwater caves of Hinatuan Enchanted river, Lake Bababu, Lake Tiktikan, Pawod, Casili and the Blue Cathedral of Siargao are Class I caves. They are extremely hazardous and only trained cave divers can access them. In Samar, which is the cave capital of the Philippines, you can find all kinds of dry and wet caves and some are Class II caves which need further exploration and regulation so that they become Class III caves. Palawan’s Underground St. Paul subterranean passage is a Class III cave, and so are the Buenavista (in photo), Silop and Cuyapnit caves of Surigao.